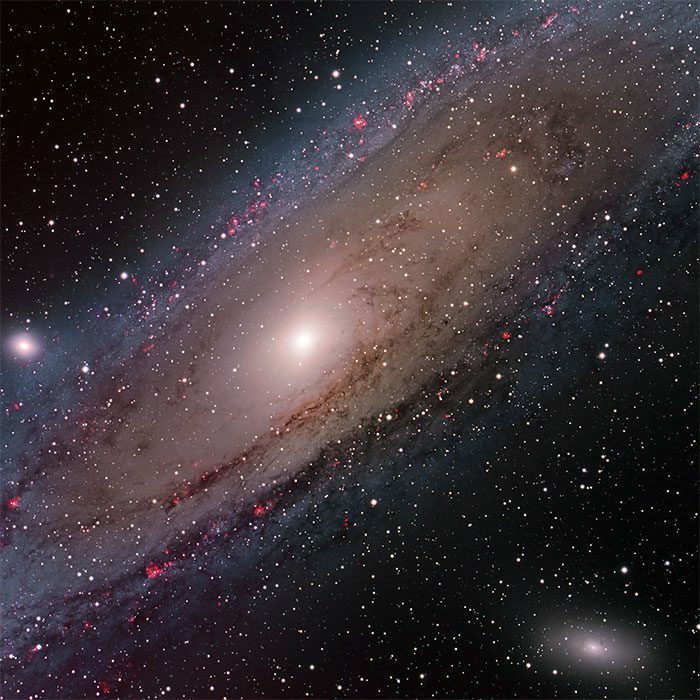 The Andromeda Galaxy, also known as Messier 31 or M31, is a spiral galaxy located about 2.5 million light-years (2.4×1019 km) from Earth. Located in the Andromeda constellation, it is the closest spiral galaxy to the Milky Way, where our solar system is, although it isn't the closest overall galaxy to the Milky Way. It is also the largest galaxy of what is called the Local Group - a collection of more than 54 galaxies including the Milky Way, the Triangulum galaxy and many smaller dwarf galaxies. The Andromeda Galaxy gets its name from the area in which it appears, the constellation of Andromeda – which is named for the after the mythological Greek princess Andromeda. Andromeda is probably the most massive galaxy in the Local Group. This is contrary to previous research which speculated that the Milky Way was the most massive because it contained more dark matter. A 2006 study put the Milky Way at around 80% the mass of the Andromeda Galaxy. There are around 1 trillion stars in the galaxy, compared with the Milky Way which has around 200-400 billion. In approximately 3.75 billion years, the Andromeda and Milky Way galaxies will collide, merging to form a giant elliptical galaxy. A team of astronomers in 2010 believe that M31 was formed between 5 and 9 billion years ago when two smaller galaxies collided and merged. The Andromeda Galaxy has an apparent magnitude of 3.4, which makes it bright enough to be seen by the naked eye on moonless nights. The Andromeda Galaxy is approaching the Milky Way at rate of around 110 kilometres per second (68 mi/s).